Editor’s Note: This is a guest post by Kellie Schoppe, a good friend of mine whom I’ve known for several years. She and I are both married to tech-savvy nerds, so our get-togethers are always filled with interesting conversations! We started an annual “Friendsgiving” tradition and have successfully prepared three Thanksgiving meals together. Thanks Kellie for sharing this recipe with us! Greetings Decanteria! I’m Kellie, a lazy cook, and wannabe crafter. I cut corners when cooking and I wish Pinterest came easy. 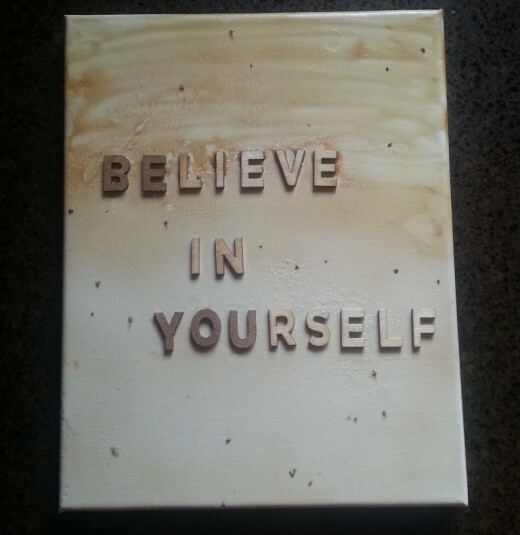 As you will see with my most recent craft… sometimes you just have to laugh. The craft started out ok but the mosquitoes landed on it while drying. Better luck next time! While I may not be the best, I do have a few tricks up my sleeve when it comes to cooking! 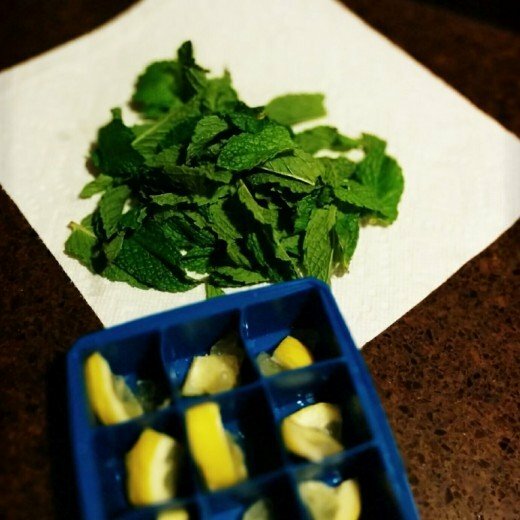 After seeing the recent Mojito recipe I’ve been on a mission to find new ways to use mint. 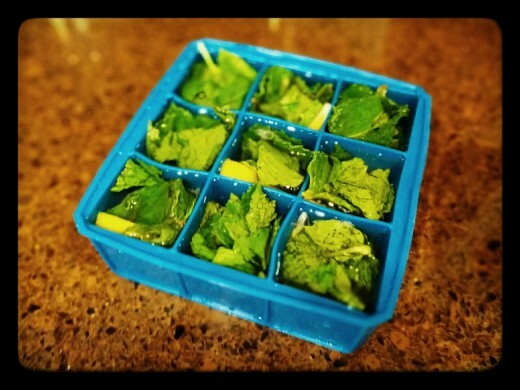 Here is a recipe for lemon/mint ice cubes. Start by washing the sprigs of mint and pulling off the mint leaves. Set aside. Cut a lemon in small pieces (small enough to easily fit into the ice cube tray). Squeeze each lemon slice into the ice cube tray and place at the bottom of the tray. Grab a small handful of mint leaves and SLAP the mint between your hands. This will help release the oils in the mint. Then place the leaves in the ice cube tray. You can rip the mint in half if the leaves are too big for the tray. Add water to the ice cube tray and freeze. 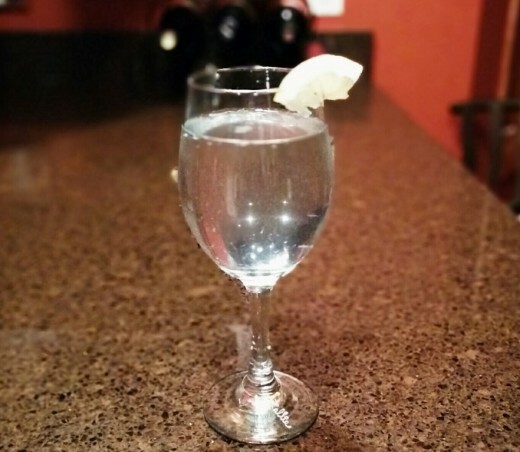 To enjoy, place lemon/mint ice cubes directly in your glass and top with water. 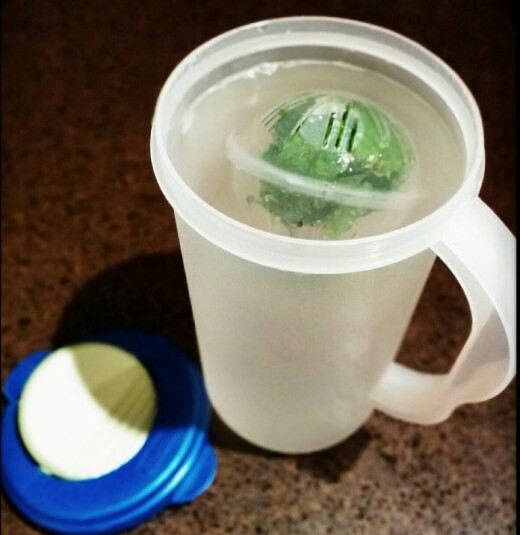 If you’d prefer to make a larger batch of lemon/mint water, place the ice cubes in a pitcher and top with water. I’ve placed my cubes in an infuser in a pitcher to limit the number of mint leaves in my water glass. The ice cubes can be stored in the freezer for up to 6 months. I can’t fail at this one and I hope you will love it too! Well, that is all for now!! Wash the mint sprigs and pull off the mint leaves. Set aside. Cut the lemon into small pieces, small enough to fit into the ice cube tray. Squeeze each lemon slice into the ice cube tray and place at the bottom of the tray. Grab a small handful of leaves and slap the mint between your hands to release the mint oils. 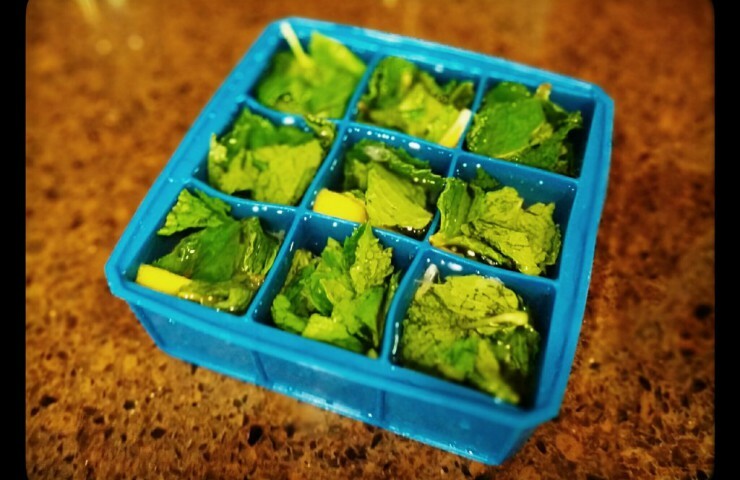 Place the mint leaves into the ice cube tray. Rip the mint leaves in half if they are too big. To enjoy, placed the ice cubes directly in your glass or a large pitcher and top with water. You can also you as infuser to limit the number of mint leaves in your water glass. Substitute the lemon for any citrus fruit to switch up the flavor!